But first the notion that a man has a body distinct from his soul shall be expunged; this I shall do by printing in the infernal method, by corrosives . . . melting apparent surfaces away, and displaying the infinite which was hid. 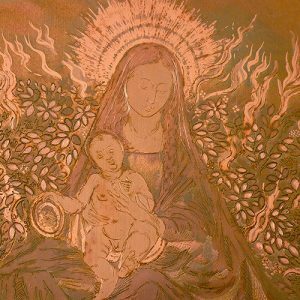 Giving attention to the connections between the practice of etching and alchemical processes and symbolism has led to a firm conviction that the discovery of etching was made as a result of alchemical experimentation, as has been shown to be the case for many other artisanal processes and disciplines. The copper plate is polished to a high lustre before being scrupulously degreased. 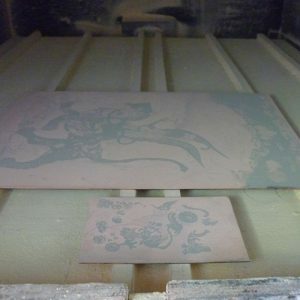 It is then ready to receive an even layer of the etching ground which is a mixture of beeswax, bitumen and turpentine. The layer of wax resist is applied using either a dabber (a leather-covered pad with a wooden handle) or a soft roller, while the plate is situated on a level surface over a source of heat. The plate must then be blackened with smoke using a tightly bound cluster of lit tapers, to create the dark, glossy foundation, which, where it is left unworked, will act as an acid resist. 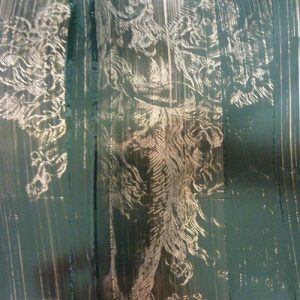 Through this ground, which obscures the brightness and beauty of the copper, the artist draws the fine point of an etching needle, delicately uncovering the areas of metal to be exposed in the acid bath. 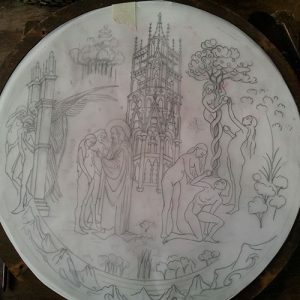 The quality of the etching ground will govern the quality and contrast of the etched line, as well as the clarity of unworked space within the inked plate ultimately impressed upon the paper. 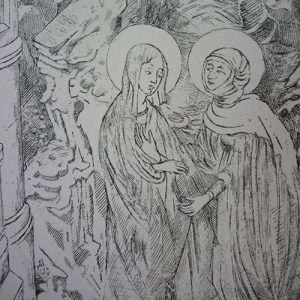 Although printing an etching is often conceived in terms of ‘multiples’, investing effort into producing low edition numbers or unique printed works, is also a satisfying and creative method of working. Experiments by William Blake are of interest for me because of his creation of hybrid artworks in which he combined etching with painting. It was this approach, in the work of both Blake and the early etcher Hercules Segers, which in a sense gave me “permission” to think of the potential for etching and painting as a combined medium. This breaking down of barriers between distinct disciplines is liberating. It allows the imagination free reign, allows the image to have a life of its own and the embodiment of idea represented in the final outcome or series of outcomes has a quality of fluidity and indeed an element of surprise.